Recently (6 hours ago), Bashiok, a Community Manager on the Battle.net forums posted some promising information about a much needed patch in the works for Diablo 3. This game has been fantastic on many fronts, but with some many strangely broken issues there are some users that are getting ready to look for their gaming elsewhere if this patch doesn’t pan out. We have posted the forum information and will be sure to give you all the updates we find as this is good news, but it is also make or break news for the team of Diablo 3. For a link to the post from the horses mouth click here or on the picture! The Diablo III developers have been hard at work on some exciting new features and updates for the game. Many of you have asked for more details, and we’re busily preparing several developer blogs filled with information on what’s coming in patch 1.0.4. In the meantime, here’s an overview of the information we’re planning to share here on the Diablo III community site in the not-too-distant future. Senior Technical Game Designer Wyatt Cheng is preparing a high-level summary of some of the system changes planned for 1.0.4. Senior Game Designer Andrew Chambers is working on a blog detailing all the ways we’re making Legendary items stand out. Following up on earlier discussions, Game Director Jay Wilson will be providing an update on how Magic Find is evolving in patch 1.0.4. Wyatt will also be providing a preview of the changes we’ll be making for each class in 1.0.4 (and the philosophy behind those changes). Of course, this is all building up to the actual patch 1.0.4 release, and we’ll be releasing the full patch notes shortly before the update goes live. We’re also planning to run some interviews and developer chats surrounding patch 1.0.4, and we’ll be sharing those on the Diablo III front page. Be on the lookout, as we’d love to get you involved in any live chats we host. As always, your constructive feedback is very much appreciated. Stay tuned for the updates to follow! Open World RPGs – What Else Can Be Done? 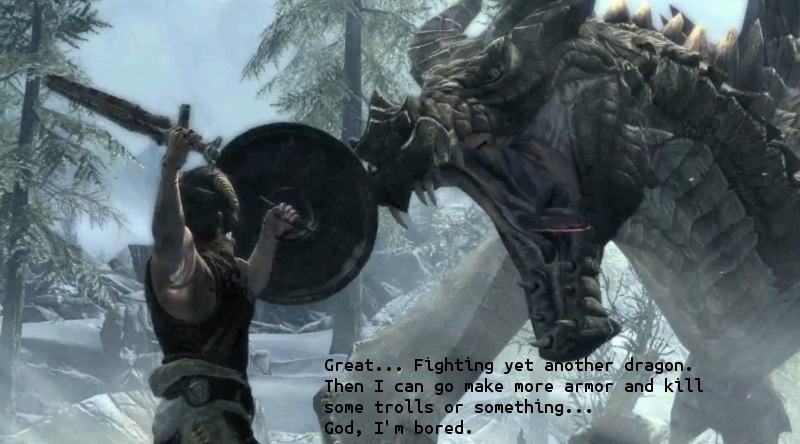 Games like Skyrim and Fallout have done a fantastic job of bringing otherwise disinterested people to the RPG scene. Yet, it feels like once you finish the main quests the games can lose their luster titles that are more action-packed. Some games like Borderlands do a really nice job of taking the boring exploration for explorations sake out of the mix and inserting crazy bad guys and mutant creatures for you to shoot and explode at your leisure. Even after a couple hours of that type of gaming you will find yourself bored of treasure hunting and shooting random baddies. Is this what your character is saying? What else is there to do at this point? You can kill things, you can amass wealth and you can even find relationships with other digital ‘people’. Granted, when all is said and done – you are still roaming a world that doesn’t seem to have a reason to be booted up. Sure, there are side-quests and random things you can do for people… like kill a guy for the Night Mother or maybe collect a trinket for some lazy scared guy. Regardless, it is an important question that might not really have an answer. Outside of turning open world RPGs into another version of Second Life – what can really be done at this point? Leveling up doesn’t matter after awhile. Not to mention to never-ending stream of DLC that seems to seduce people regularly into forking over another $10-20. Some DLC is well worth the payment but at what point are we going to expect something more and realize that there really isn’t more to be had? Is it a sign that perhaps it wouldn’t hurt if games started having some sort of finality that pushed to you play through the story again and again in different ways? Mass Effect did this and it was nice that they actually tied Achievement Points to playing through the game multiple times. Even games like Diablo 3 and Borderlands give you multiple character types to build up and roam around with. What is your take? Is there anything more that can be done for open world RPGs? If you say yes, what are your suggestions? Post in the comments below! Author NoobTubeTVPosted on July 19, 2012 Categories Gaming Blogs, News, Reading, SuggestionsTags Assassins Guild, Borderlands, Borderlands 2, Dark Brotherhood, Dark Knight, Dawnguard, Diablo, Diablo 3, DLC, Fallout, Fallout 4, Fallout New Vegas, RPG, Second Life, SkyrimLeave a comment on Open World RPGs – What Else Can Be Done? Well worth $60 and the eleven years many fans have been waiting. I think I might be one of the ten people that haven’t ever played the Diablo series until this week. The last Blizzard game I played at length was the first Warcraft on shareware. 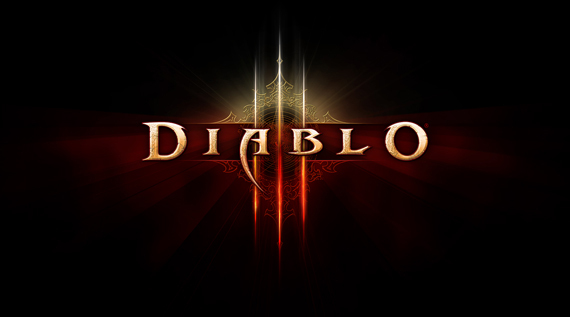 Diablo was a pleasant surprise because it let me know from the get-go that it was going to be gentle when it came to introducing me to a new experience. This game is a hack and slash version of Borderlands. If you want a game like Warcraft… go get Warcraft 3. This game focuses on the ability to roam the world of Diablo 3 looking for a fight and arming your character with the best weapons for your class. This game is so similar to Borderlands that it is really the best way to describe how the non-combat system works. My current class is a Demon Hunter named Lech. I like to run around dual wielding crossbows. I have been lucky to team up with my friend Deckon and he was awesome enough to hook me up with my first decent weapon. Since that point back when I was a Level 3 I have found a lot more weapons that make me want to curse the day I was using my initial weapon. If you want to get/play this game you will have to be sure that your PC can handle it. Keep in mind that this game is NOT for consoles. 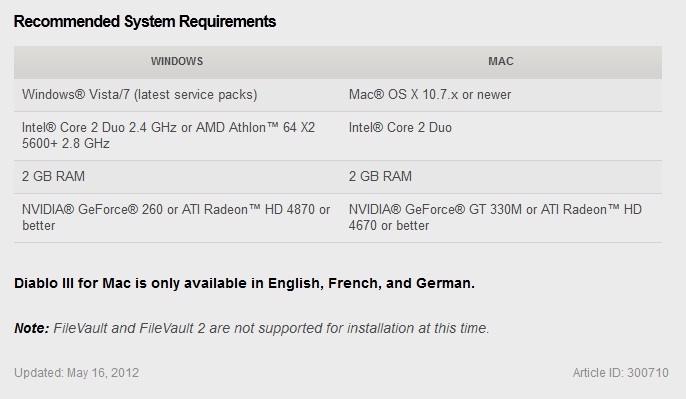 Minimum specs should be avoided when gaming on PCs. This is often setting people up for less than optimal gaming experiences. I am currently running a 460GTX and have a fantastic experience. 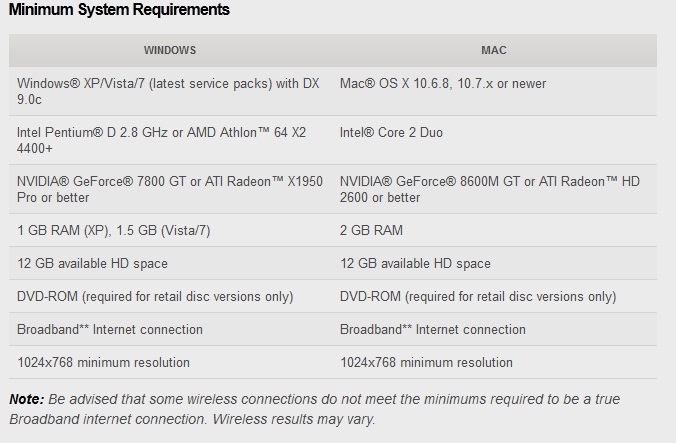 If you can afford to do this type of computing, I highly suggest you roll with something with specs at or above these.